Two weeks ago, when I met up with my friend, Dave (of luvs diapers commercial fame), we had dinner at Eatery NYC, which was really great. I didn't get pictures of my food :( but I had an amazing "winter salad" and cucumber and thyme martini. It's a thing! 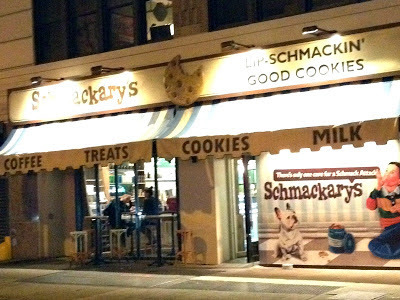 But the highlight of the evening was after dinner when Dave suggested we head over to Schmackarys - Lip "schmackin" good cookies! I was in heaven. Sheer Heaven. How did I not know this place existed?? I had a really hard time deciding which cookie I wanted: Classic Chocolate Chip? Flutter Nutter? Peanut Butter After Dark? Red Velvet? Cookies and Cream? Candied Yam??!! 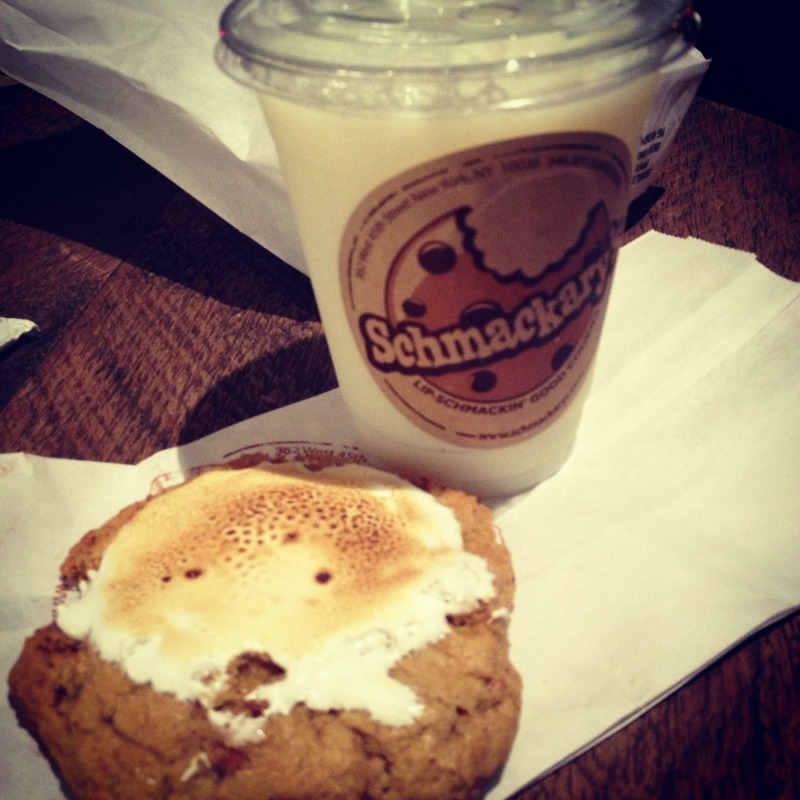 I finally settled on a small glass of milk and a Candied Yam cookie, in the spirit of the season. I also got a classic chocolate chip and a peanut butter cookie to take home to Chris. 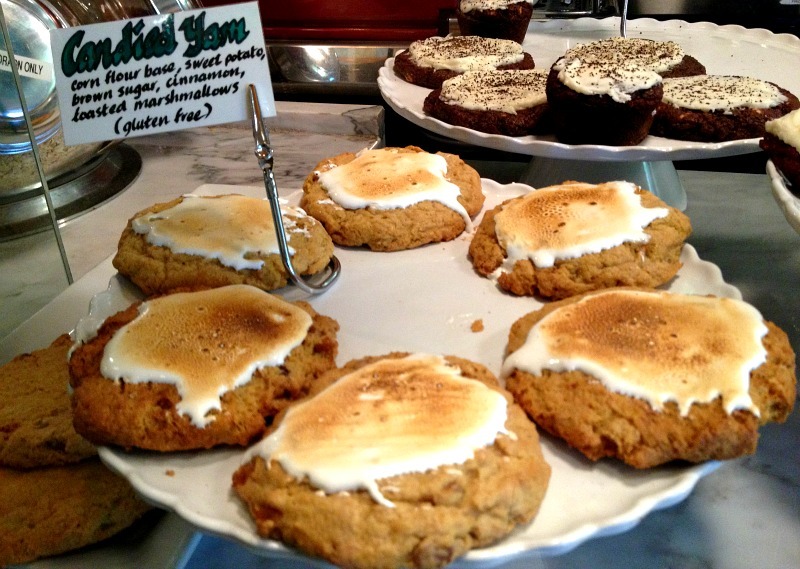 Truth be told, I wasn't totally sold on the candied yam cookie. It was too sweet or too something. I ate half of it and then ate half of the classic chocolate chip cookie (maybe more like 3/4...or possibly 7/8th? 7.5/8ths? I had to save some for Chris) and THAT WAS AMAZING. The sea salt, the melty chocolate, it was worth the belly ache I had the whole way home. And so, I find another New York food gem that I just can't resist. yes, it's an awesome place! 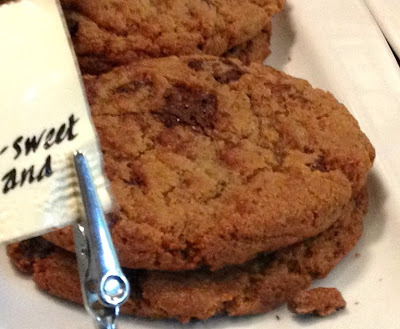 I can't stop thinking about the sea salt chocolate chip cookie! Yea, if I ever go back there, I'm going to def. 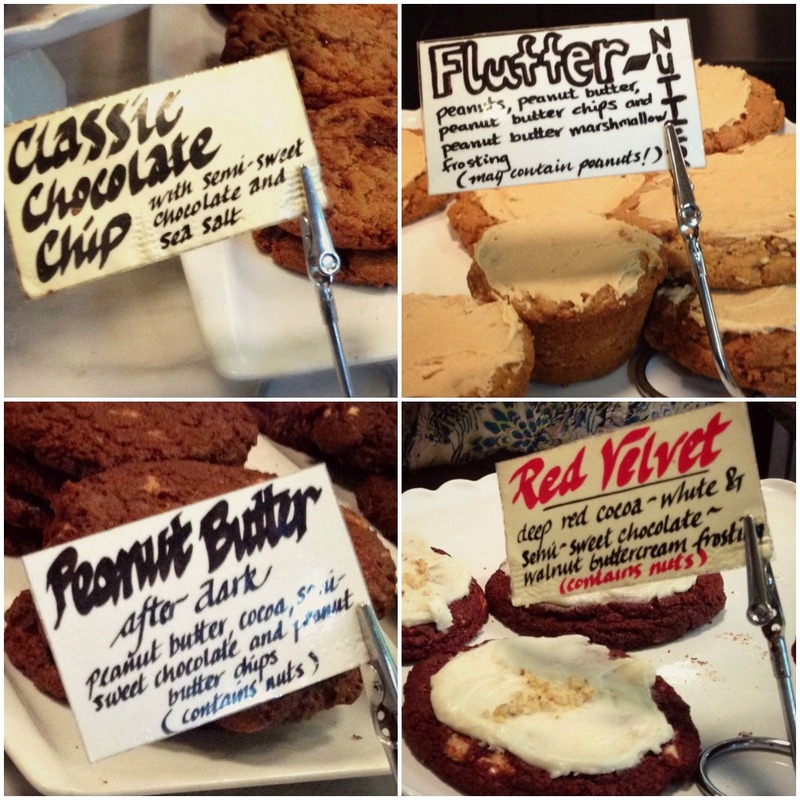 try the red velvet - i've never had red velvet in cookie form! That looks so yummy...I might need to remember this place! You def. should get here sometime if you can! I really want to try the red velvet cookie next time! I know me too!! They're the BEST!